In a skillet, sauté mushrooms with butter over medium heat, till all the water evaporates. Then stir in green onions and sauté over low medium for 1-2 minutes. Meanwhile dissolve starch in milk and add salt, eggs and seasoning. Mix them all. Preheat the oven to 350-375F (180-190 C) and place mushrooms in a Pyrex or baking dish and sprinkle feta/Mexican Cheese over them. 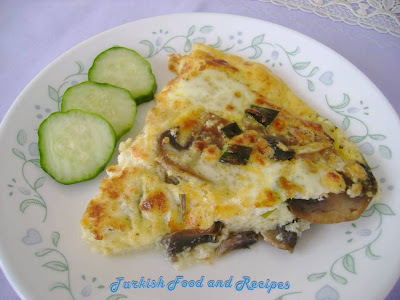 Finally pour egg-milk mixture and stir gently with a fork to distribute mushrooms and cheese evenly in egg mixture. Bake for 25-30 minutes, till the surface turns light brown. 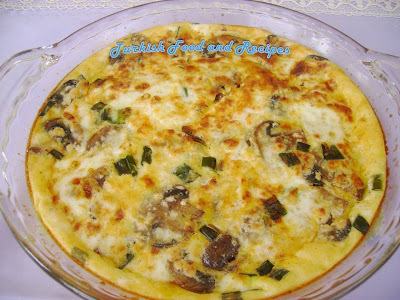 Serve Cheesy Mushroom Egg Casserole warm. Mantarlari tereyagi ile bir tavada mantarlar suyunu cekene dek orta ateste kavurun. Ardindan yesil soganlari ilave edin ve kisik ateste 1-2 dakika cevirin. Bu sirada bir kasede sut ile nisastayi karistirin ve icine yumurta, tuz ve baharatlari ilave edip, karistirin. Firini 180-190 C(350-375F) isitin. Borcam tepsiye once mantarlari, sonra ufalanmis peyniri koyun ve son olarak yumurtali sut karisimini uzerine dokun. Hafifce karistirin. Uzeri kizarana dek yaklasik 25-30 dakika pisirin. Mantar ve Peynirli Yumurtayi sicak servis yapin.